There is a plethora of SEO tools available on the market at the moment, so you are forgiven if you have no idea what to choose. I have played with several SEO tools before I managed to choose the one that is best suited for my needs (I will not tell you which one I have picked because each tool mentioned in this list is extremely useful). I will tell you however that the SEMRush development team has gone out of its way to create an exquisite marketing tool. The main aim of SEMRush is to excel at keyword research, Google Adwords research and competitive analysis. They have created the SeoQuake toolbar for Firefox Mozilla, and they have also equipped their suite with many sturdy keyword insights tools. They also have a great SEO blog! We will tell you from the start that what it lacks in the on-page analysys and link-building departments, it compensates in competitive analysis and Adwords monitoring. It is actually so good at what it does that without the other features it has still managed to land a top spot in the lists for best SEO tools. So let’s take a look at its main capabilities. If you are active with pay-per-click advertising, keyword researching, Google Adwords and you want a closer look on your competitor’s strategy, SEMRush will get things done. This tool has become a staple in many search engine optimizer’s toolkits, and if you are serious about your business you should definitely give it a test drive. SEMRush is for people who seriously want to spy on their competition because it allows you to research specific domains. In other words, if you are interested in how your competition is doing, you can find out what keyword they are targeting, and what they are doing in order to achieve their goals. With the research tool you will obtain instant results. You can research a keyword phrase or a domain name with this tool. Similarly to the other tools mentioned above, you can use different filters in order to get more specific results. In addition to this you will also be able to see the top 20 sites that rank for that specific keyword. This data is essential because it can give you more ideas on how you can promote your own website. The domain search works a little differently. Once you type the domain name in the search box you will receive an interesting overview of their competition, traffic and keywords. Last but not least, you can research a specific URL for more specific information. This tool is particularly handy for internet marketers. The Adword report sheet will display traffic, costs, competition, results and trends. Furthermore, you can also see how many adverts Amazon is buying from Google. Every time you click a keyword that you are searching you will see detailed information about it. You will have specific filters and parameters that will ultimately help you narrow your searches, but it is up to you to look around. The tool is great, but you will have to familiarize yourself with it. The only way to truly learn and perfect yourself is by understanding your mistakes. With the competitor analysis tool you will have access to weeks and weeks of trials and errors in your marketing strategy. From it you can pull the strongest elements of your competitor’s strategies, and apply them to your own strategy. The best way to analyze your site is through the eyes of your adversaries, and SEMRush will provide you with seamless insights on the matter. The more tools you use in order to compile your keywords list, the better the chances to advance through the SERPs. Do you want to advertise and optimize your site? If the answer is yes, then you should know that SEMRush can be used to determine exactly how valuable the chosen keywords are. If you are working on a budget, SEMRush will pintpoint the most reasonable methods of gaining traffic. As a matter of fact there are many keywords that are low cost (especially the long tailed ones), and you will be able to identify them with one click of a button. We recommend that you bid for low priced long-tail keywords, rather than one expensive keyword. 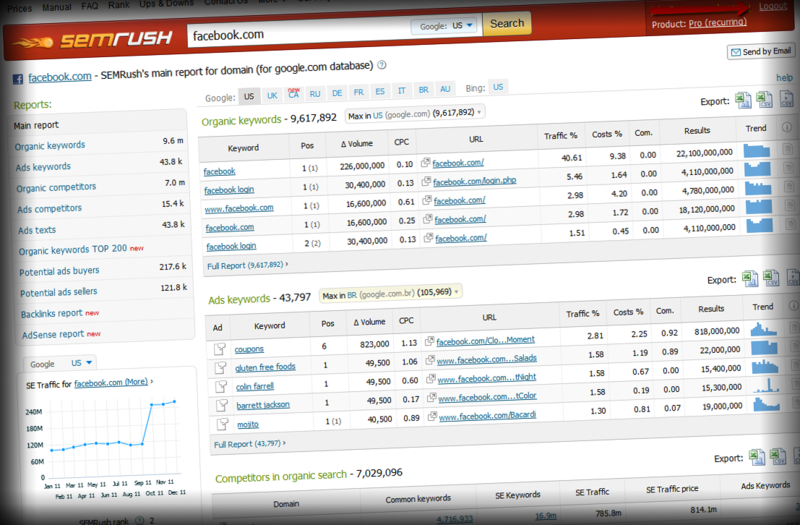 SEMRush will also create valuation charts and traffic charts for you. You can gather them and lay them out so that your clients will easily understand them. Find the best places where you can advertise! This suite will look into the keywords that you are using and bidding on, and determine the sites on which they would naturally work. All you have to do next is to contact the webmasters and ask them if you can advertise on their pages. In my opinion, SEMRush is the best keyword and competitive research tool, and although it still lacks in terms of on-site SEO optimization, it stands out with the help of its existing features. It is actually incredible how much information you will be able to pull from Adwords and organic searches. If you do not believe me you can take the tool for a test-drive for free. SEMRush offers several packages (Pro and Guru) that offer access to different tools. The Guru package is usually destined for somewhat larger sites and it can return up to 30.000 results per report, and it has API acces with 500.000 units. All in all, it is worth its price, because it offers unparalleled insights on your competition and keywords.